Don't forget to add Coco Fiber growing medium! A worm farm is like a potted plant, only without the plant. It’s a large container filled with soil, with drainage holes in the bottom and a lid to keep out the rain. Living in the soil are several hundred worms. Kitchen scraps (teabags, potato peelings, eggshells and so on) are put in the top, and the worms convert this into nutrient-rich fertilizer. 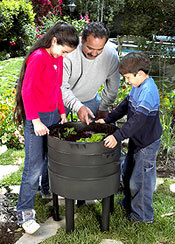 These can then be added to your vegetable garden, and the process starts again. The Can-O-Worms worm farm is user friendly, easy to operate and fun for all ages. It is so versatile that it can be left on a balcony or in a laundry for apartment dwellers, in a shed or in a shaded outdoor location for those with a yard. For keen fishermen the unit will breed up to 20,000 bait worms which are easily removed from the top! Easy harvesting of castings (worm poo). Worms eat their way up leaving their rich castings behind, readily removed, free of worms. Liquid fertiliser is also produced and dispensed through a tap. The Can-O-Worms stands on five sturdy legs. A ‘Collector Tray’ - the one with the leg spaces, centre mound & tap hole underneath. Three ‘Working Trays’ - these are the ones with the mesh bases and are interchangeable. One plastic tap and a nut. as a stand for the system. 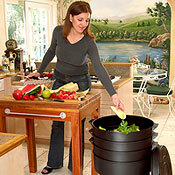 Composters - There are only a few species of these, mainly ‘Tigers’ and ‘Reds’ and 'Dendras'. They live and breed happily in an organic rich environment like a Can-O-Worms. You can purchase new red composting worms from PPM. Earthworkers - These are the many others which prefer to live in a less controlled environment. They will not thrive in food wastes but prefer soil and humus as their basic diet. It is important to make sure you use only composters in your Can-O-Worms since earthworkers will not do well. Conversely you shouldn’t add composters to your soil as they are not likely to survive when the soil dries (the exception to this is a heavily mulched garden). The compost worms in your Can-O-Worms will produce worm manure called castings which can be used in your garden as a soil improver. The Can-O-Worms worm farm comes with a five (5) year warranty on materials and workmanship.